The excitement around Cleveland’s long visit to Oklahoma City this weekend isn’t quite what it has been in recent years when the meetings between the teams featured two of the most explosive players in the game in LeBron James and Russell Westbrook. James left Cleveland for the Los Angeles Lakers after last season and the Cavaliers are still looking to find their footing in their second post-James era. But Cleveland enters Wednesday’s game in Oklahoma City having won two of the last three games, including wins over Philadelphia and Houston. Both teams are trying to keep things together despite a rash of injuries. Oklahoma City has shooting guards Hamidou Diallo and Terrance Ferguson, who have started a combined 17 games this season, listed as out with left ankle sprains and center Nerlens Noel listed as questionable with a left calf contusion. The injuries — not only to those three but the injury that has kept Andre Roberson out for the season to this point and forced Westbrook out for eight of 19 games so far, have opened up playing time for inexperienced players. Cleveland has been without Kevin Love, the top returnee after James’ absence, for all but four games this season after he underwent toe surgery in early November. Sam Dekker has missed three weeks with a left ankle sprain, and point guard George Hill has missed nine consecutive games with a right shoulder sprain. Hill is expected back soon. 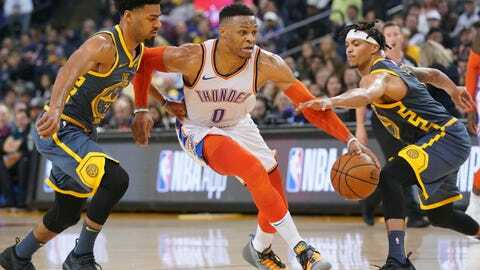 They need Hill back quickly, with games coming up against some of the top point guards in the league, including Westbrook. Rookie Collin Sexton has been manning the position in Hill’s absence. With all of the injuries, Tristan Thompson has been a focal part of the Cavaliers’ efforts on both ends, with four consecutive double-doubles and 10 total this season. In Monday’s loss, he had 16 points, 11 rebounds, three assists, a steal and a block in 40 minutes.